Ant-Man is not exactly the coolest nor the most profound of superheroes. By description he’s the goofiest of superheroes, and seemingly the narrowest in terms of his functionality. The challenge with this movie is to effectively explain to the uneducated what a man shrinking down to the size of an insect is good for. Fortunately, the movie is very good at explaining itself. You don’t believe one minute of it, and the logic has holes that you could throw The Hulk through, but it makes for an entertaining movie that doesn’t drive you away with distracting logistical question marks. The masterstroke of Ant-Man is that it is, from one end to the other, a comedy. That’s the only real way that you can approach this character. The humanity comes from the character’s flaws. Scott Lang is a petty criminal with a crippling sense of arrested development. He’s a divorced Dad trying to get his life together while also providing for his daughter and dealing with the fact that he has just stepped into the role of a superhero who can shrink down the size of a LEGO. That’s really all the story that is needed here. 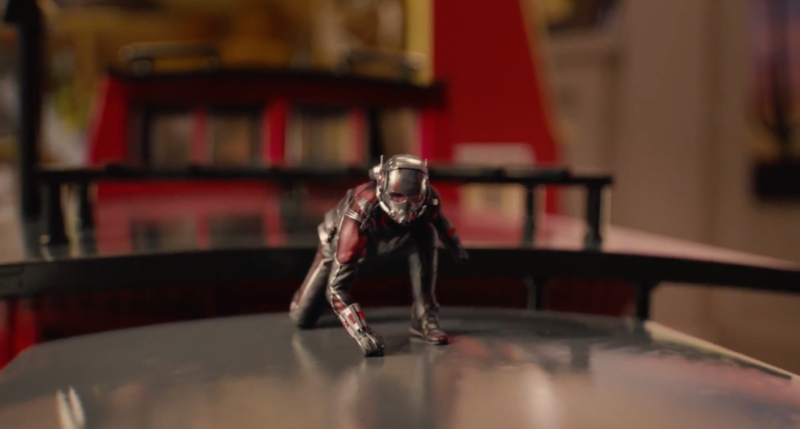 The point of the film is to use Ant-Man’s miniscule size for a great deal of fun special effects as he traverses a world in which the most rudimentary object is the size of a skyscraper. This is especially effective in the climax. I’ve complained about the Avengers movies becoming victims of a trash and bash ending, but here the writers are able to get really creative. Using ingenuity that ebbs somewhere between The Incredible Shrinking Woman and Honey, I Shrunk the Kids, the action scenes move within a micro-world that is harmless when you’re normal height but terrifying when you’re the size of an ant. Ant man is threatened by rats, a record player, a bathtub, a vacuum cleaner, a toy train set, a shag carpet, and a room full of dancing feet. The special effects here are really creative, not just at recycling explosions but creating a world for Ant-Man to play in. I’m starting to really enjoy myself in the MCU when the filmmakers let go of real-world stuff and just create a world to play in. Ant-Man is not the most profound nor the most endearing of Marvel’s Cinematic Universe but, for my money, it is one of the most creative. It may not be true that anyone really wanted to make this movie, but when they did, the filmmakers knew what they had and let their creativity go nuts.